There are some really crazy prices from Seattle to Tokyo showing on Vayama.com at the moment. They're about 50% of what they usually cost. It looks like you need to depart before May 31 and come back sometime in June. 2. Search for a flight from Seattle (SEA) to Tokyo (HND) - note that it needs to be Tokyo's HND airport. flight deals, seattle, sea, tokyo, japan and hnd. 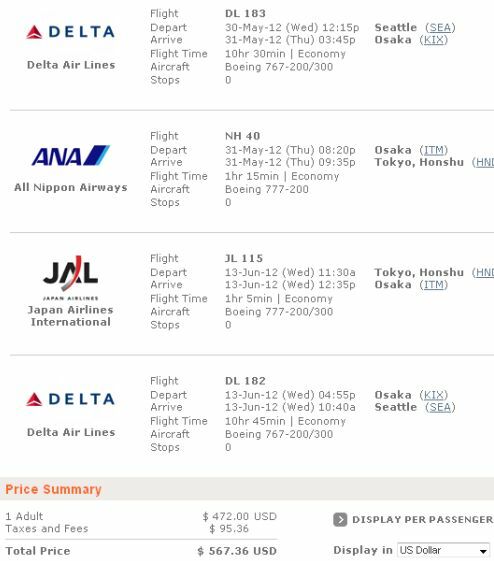 4 Responses to "Seattle to Tokyo, Japan - $567 roundtrip after taxes"
Booked this a few days ago, but it got bounced back a day later as the airline rejected the fare according to Vayama. So YMMV. Anyone else actually get a confirmation? shoot. i was looking to book this today! Was anyone able to find this flight? I think it's gone now Michelle.